CONCISE ANALOGY OF "KPA" (THE LA-KPA) THE ANCESTRAL UNIVERSAL TESTIMONIAL DIVINITY. THE KHEPERA, THE KHEPRA-TA & THE PTAH OF THE GREEK. THE ANCIENT UNIVERSAL DIVINITY "LA" KNOWN TO THE GREEK AND OTHER NATIONS INCORRECTLY AS "RA" & THE DIVINITY "KPA" ALSO KNOWN TO THE GREEK AND OTHER NATIONS INCORRECTLY AS "KHEPERA" DID NOT ORIGINATED FROM THE GA-ADANGBES OF THE PRESENT GHANA NOR ORIGINATED FROM THE PRESENTLY KNOWN CITY SUB-NATION OF THE GA-ADANGBES KNOWN AS THE "LA"-ASAFO. THE MASTER DIVINITY "KPA" ( KHEPERA ) DOMAIN IS HISTORICALLY KNOWN AS THE ORIGIN AND THE ORIGINATOR WITH THE ONLY DOCTRINISM AS THE SPIRITUAL CONDUCTOR AND BELIEVES PRACTICES IN WORSHIPING THROUGH OR TO THE SUN AS THE ONE AND THE ONLY SOURCE SYMBOLISM TO BE WORSHIP UNIVERSALLY AS THE SUPREME DIVINE CREATOR OF THE UNIVERSE, WHICH IS NOW KNOWN TO OTHERS AS THE WORD "GOD". THE ANCESTRAL UNIVERSAL DIVINITY "LA" ( RA ) NAME IS NOT USED BY THE NOW LA-ASAFO CITY ONLY, THE DIVINITY NAME "LA" IS ALSO HONORED BY OTHER DIVINITIES WITHIN THE GA-ADANGBE REGION, THEY ARE THE DIVINITIES : "LA"-KPLEKU, "LA"-NIOGBE, "LA"-SHIELE, "LA"-SHIOKO AND "LA"-FA, ect. THE OTHER DIVINITY THAT HONORED THE ANCIENT ANCESTRAL DIVINITY "LA" IS WITH THE SPIRITUAL SISTER CITY OUTSIDE THE GA-ADANGBE REGION, KNOWN AS "LA-TE" ( LA-TER ) OF THE AKWAPIMS - AKROPONGS. THE CITY OF "LA", THE ( LA-ASAFO ) OF THE GA-ADANGBE REGION OF GHANA, IS IN CONTROL BY THE LA-ASAFO AS THE INDIGENES AND OWNER OF THAT SOVEREIGN GEOGRAPHICAL, POLITICAL DOMAIN PROPERTY. "LA", = "FIRE" AS ( "LA"-ASAFO ) WAS NAMED AFTER THE-FIRE DIVINITY "LA", WHO WAS THE SECOND CREATION AND THE PROTECTOR OF THE "SUN", THE FIRST CREATION ( AS THE FIRST BORN MALE ) WAS THE DIVINITY "TE" AS "TETTEY-LA-KPA". IN RETROSPECT, THE NAME/WORD "SUN" WAS NOT A DIVINITY NAME, THOUGH THE MATERIAL "SUN" IS THE SOURCE OF ALL LIFE, IT WAS KNOWN TO THE PRE-EGYPTIANS AS A SYMBOL NAME "KPA" ( KHEPERA ). THE ANCIENT ANCESTRAL NUBIANS OF THE THEN NUBIAN PLAINS / THE PRE-EGYPTIANS, WORSHIPED THE MATERIAL SUN AS THE DIVINITY "KPA" (KHEPERA), REPRESENTING THE WORD/NAME GOD. 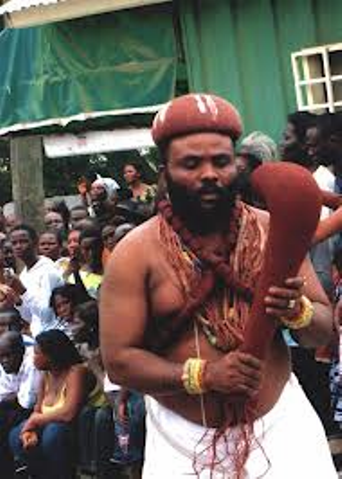 THE LA-ASAFO, PART OF THE GENERATION-DESCENDANTS OF THE DIVINITY "KPA" ARE IN POSSESSION WITH THE "KPA-LEGACY" PRACTICES OF THEIR ANCIENT ANCESTORS AS THEIR DUTY AND STILL HONOR THEIR ANCESTRAL FESTIVALS, NOW COMBINED TO THE NAMED ( HOMOWO ), CORRECTLY : "HOMOWOO ",= FASTING, TO THE HARVESTING AND THE ORIGINAL NEW YEAR FESTIVAL ALSO AS A LEGACY. WHICH IS NOW " THE SACRED ATONEMENT-YEARLY HARVESTING, FASTING & NEW-YEAR FESTIVAL " . LATER IN HISTORY, THE NAME "LA" WAS INCORRECTLY TRANSLATED TO THE WORD "RA" BY EARLIER EGYPTOLOGISTS AND ANTHROPOLOGISTS, JUST AS THE NAME "KPA" WAS ALSO PHONETICALLY INCORRECTLY TRANSLATED AND SPELLED TO THE WORD " KHEPERA & PTAH ". "KPA" WAS ATTRIBUTED AS THE SUN SYMBOLISM AND WAS HONORED AND ADDRESSED AS "KPA" BY THE ANCIENT ANCESTORS, WHO WERE THE NUBIANS. "KPA" WAS NOT ADDRESSED AS KHEPERA, KHEPERA-TA OR PTAH BY THE ANCIENT ANCESTRAL NUBIANS WHO WERE NOT OF A GREEK TONGUE. KHEPERA WAS "KPA". Note: Above, La-Kpa wulomo Numo Yemo-Obron-VII head symbol and the below Ancestor "Kpa" head symbol of the back shell of the Beetle as smooth, hard and round symbolizes the human form head, and the Eagle wings also on the Dung Beetle is wrapped around the human form symbol, both representing the "Divinity-Kpa". THE IBIS BIRD HEAD ON A HUMAN BODY WAS BASICALLY FOR THE SCRIBE OF THE "DIVINE-KPA" (WRITER OF THE HOLY TESTIMONIAL SYMBOL-WORDS OF CREATION " HIEROGLYPHS " ) AND THE IBIS BIRD SYMBOLIZES THE WRITTEN SYMBOLS OF THE KPA TESTIMONIES. 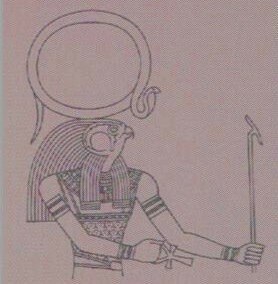 IN ESSENCE, THE SPIRIT SOUL OF "ANI" THE HUMAN "TUTU-ANI" WHICH HE INHERITED AS A LEGACY FROM THE DIVINITY "KPA" ( THE UNLAWFULLY & IMMORALLY ACCLAIMED AS KHEPERA, PTAH OR KHEPRA-TA OF THE GREEK ) WAS THE HUMAN FORM AND THE EAGLE AS HIS SYMBOL. 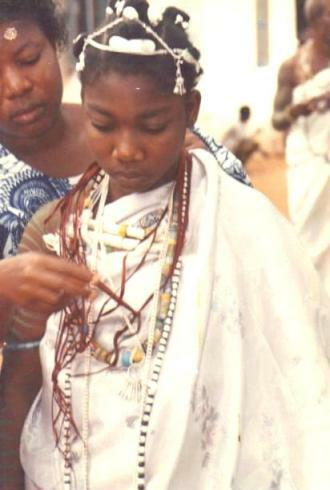 THE EAGLE FEMALE FORM IS SPIRITUALLY REPRESENTED BY THE WIFE OF THE LA-ASAFO LA-KPA-WULOMO OF THE GA-ADANGBES, SHE IS HONORED AND ADDRESS AS " AFIEYIE- OKROPONG". THE NAME OKROPONG IN ENGLISH IS " EAGLE ". 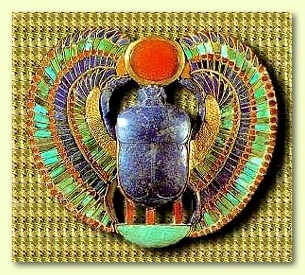 THE DUNG BEETLE WAS EARLIER HONORED AND DECORATED WITH THE POWER AND THE WINGS OF THE EAGLE. THE EAGLE/WINGS HAS BEEN A SPIRITUAL HONORING UNIFORM AS A SYMBOL FOR THE ANCIENT NUBIANS HIGHER AND HIGHLY INCLINE SPIRITUAL ORACLES. THE DIVINITY NAME "KPA" WAS CORRUPTED BY THE GREEK WITH THE WORDS "PTAH", "KHEPRA & KHEPERA". YOUNG NAA-AFIEYE, THEN "THE EAGLE" 1989, SPIRITUALLY KNOWN AS OKROPONG. "Kpa-Te" ( Koklo-Kpa-n-Te ) The dung rolling beetle, preparation to feed the only begotten . "TE" ( TETTEY ) The first born male of the divinity "Kpa", on the tongue of the Ga-Adangbe you may hear the addressing saying to the "Divinity Kpa" as : Tettey La-Kpa. The Egg; - ( THE ONLY BEGOTTEN ) as “OSA” ( MENSA ), the Greek “OSIRIS” ; - the Spirit-Soul of “KPA” (Khepera) the part of “NU” (Nutem). And the OSA's resurrections to the living and the dead.